The parish was in the Spalding sub-district of the Spalding Registration District. You can also perform a more selective search for churches in the Cowbit area or see them printed on a map. 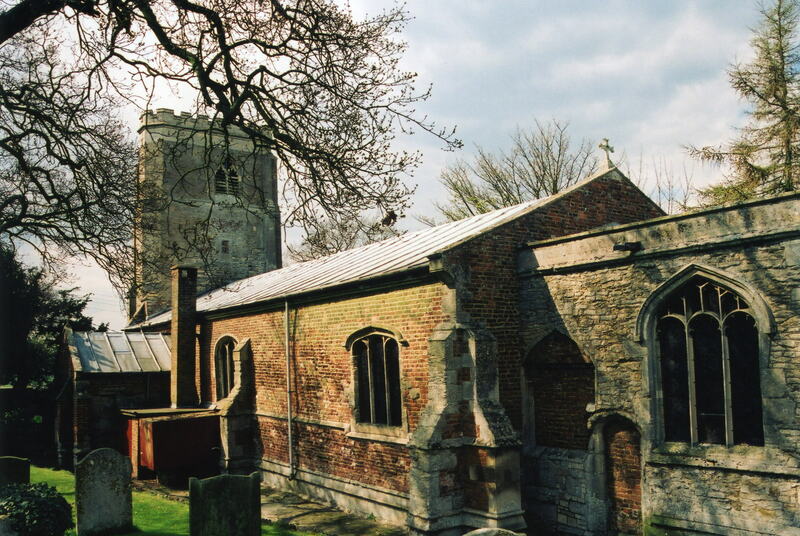 The Anglican parish church was built circa 1200. The Anglican parish church is dedicated to Saint Mary and was consecrated in 1486. The Rev. John T. DOVE, vicar of Cowbit in the 1880s, made Newspaper Headlines with his behavior. [contributed by Zeli, 2010]. The church was restored in 1882. Anglican parish registers exist from 1561. We have a partial parish register extract, with only a few entries in it. Your additions to this are welcome. We also have an extract from Phillimore's Marriages for Cowbit, 1769 - 1800, provided by Carol J. Markillie. Cowbit is in the West Elloe Deanery. Parish burials exist in the National Burial Index (NBI) where 965 burials are reported from 1813-1900. The Free Methodists built a chapel in the parish in 1842 and rebuilt it in 1861. 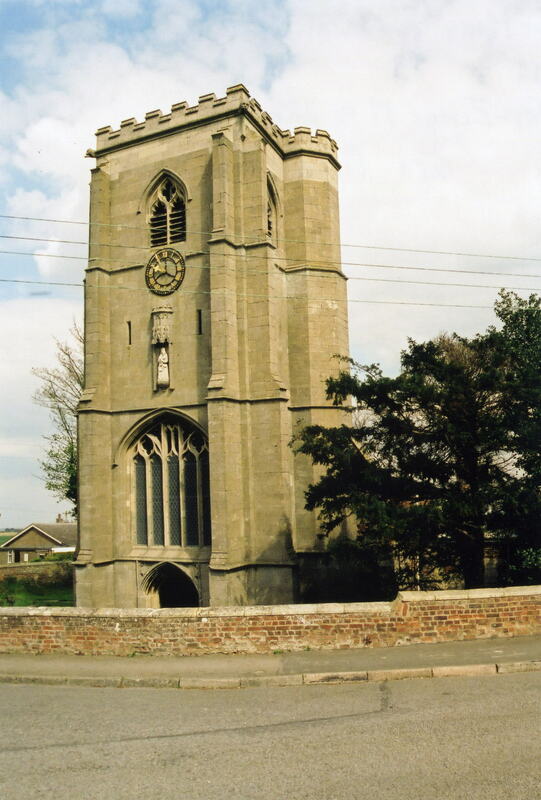 Cowbit is both a village and parish about three miles south of Spalding. The River Welland forms part of the western border, with the area called Deeping Fen across the river. Crowland parish lies to the south and Weston parish to the east. The area is about 4,500 acres of flat fenland, drained by many small canals. By 1913, the parish had been reduced in size to about 1,950 acres. Take the A1073 north from Crowland or south from Spalding. Where it intersects the B1357, you are in Cowbit. Contact Fowlers of Spalding for information on bus service, Holbeach Drove, PE12 0SD, tele: 01406 330232. Ask for a calculation of the distance from Cowbit to another place. You can see the administrative areas in which Cowbit has been placed at times in the past. Select one to see a link to a map of that particular area. Swans were bred here in ancient times. The village had a court of "Swan Mark". Cowbit Wash was the site of an occasional Speed Skating event in the early 1800s. The sport dates back to around 1700. The National Skating Association was set up in Cambridge in 1879. A MAN SHOT IN MISTAKE FOR A WILD DUCK -- On the night of Tuesday last, a person named GOODERSON, while in his fowling skiff in Cowbit Wash, fired at what he considered to be a group of birds; but was horror-struck when he immediately afterwards discovered the object of his aim was his old comrade JACKSON, who like himself was in pursuit of birds; but faint hopes are entertained of poor JACKSON's recovery. In Winter, the Welland oft freezes over. But it is not always safe to cross. On Tuesday evening, the 18th inst. a melancholy accident happened on the river Welland. An aged woman of the name of HAYNES of Cowbit had been to see some of her friends in Deeping Fen, and in her way thither in the morning, had crossed the river upon the ice. Two of her friends, fearful that she might meet with some accident in re-crossing the river in the evening, kindly offered their assistance to accompany her over the water; and the party had got nearly half over, when the ice broke, and the three women were immersed in the river. Mrs HAYNES, and a young woman of the name of Ann EVERARD, a servant of Mr Parr were drowned. *The Leeds Mercury:Saturday, February 3, 1810; Issue 2324* also had an account of this tragic accident. They add the other lady in the party "was with difficulty extricated and has since recovered." In 1842, the chief landowners were Maurice JOHNSON and J. R. CARTER, but the GEDNEY, DYSON, CHILDERS and GUY and other families held property here. There is a stained-glass window in the parish church to Lieut. Arthur DOVE who was lost at sea when HMS Atalanta sank and her entire crew was lost in 1880. The lieutenant was the vicar's son. 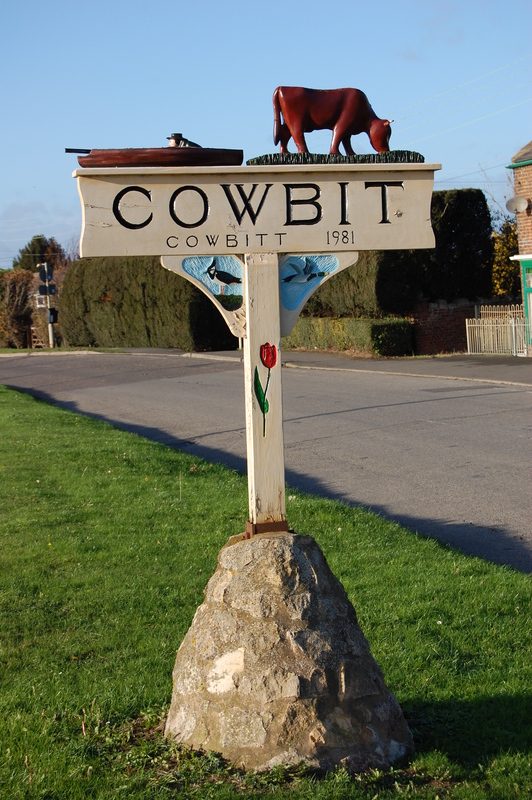 The name Cowbit is from the Old English Cu+bit, or "Cow enclosure". The locals pronounce the village name as "Cubbit" or "Cub-it". This place was an ancient Chapelry in southern Lincolnshire but became a separate modern Civil Parish shortly after those were established. You can contact the local Parish Council regarding civic or political issues, but they are NOT staffed to assist you with family history. In 1616, Francis STANWELL left a house and land to generate yearly doles for the parish poor. An unknown donor gave Town House to be occupied by paupers, with small gardens for each occupant. Half of it was destroyed by fire around 1816. In 1801, the commons here were enclosed and a few acres set aside to generate rent charges for distribution to the poor. In 1712, Thomas ANDREW endowed the Free School with land, but the school house was given by William GUY in 1800. The school land was augmented by allotments at the enclosure, in 1819, of 28 acres let out for rental income to fund the school. In 1842 it had 30 free scholars and in 1913, as a Public Elementary School, it had 104.